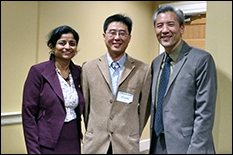 Best Pitch Winner Shuwei Li (center) with Office of Technology Commercialization Executive Director Gayatri Varma and UMD Associate Vice President for Innovation & Entrepreneurship Dean Chang. The University of Maryland’s (UMD) annual Bioscience Day event held on campus Thursday, November 19, offered researchers the opportunity to present their innovations and explain why they matter to the world. As part of Bioscience Day 2015, a Professor Venture Fair showcased faculty and student inventions to investors and entrepreneurs, providing researchers with the chance to get commercialization advice and establish connections with potential partners and businesses. Associate Vice President for Innovation and Entrepreneurship Dean Chang moderated the fair. The panel of judges was comprised of Ken Malone, Matt Cohen, James Hoberg, and Matthew Miessau. Five presenters—with inventions that ranged from a tool that can predict the outcome of cancer treatment to a sensor device and cloud-based system that can reduce lower back injuries—were selected to present their work at the Venture Fair. Shuwei Li, an assistant professor with the UMD Institute for Bioscience and Biotechnology Research, presented his new and innovative reagents and methods for protein sequencing. Li has developed a method to detect proteins of low abundance that cannot be amplified easily, unlike nucleic acids present in DNA. “Like next generation DNA sequencing that has made $1K genome possible and revolutionized medicine and agriculture, the next generation protein sequencing will have broad impacts on clinical diagnostics and precision medicine,” said Li. His technology is also a step ahead of current technologies because it enables the detection of how individual cells respond to drugs. At the UMD Institute for Bioscience and Biotechnology Research (IBBR), Research Professor Alexander Andrianov has developed multifunctional polymers that can carry drugs and vaccines, and are chemically diverse, biodegradable, and water-soluble. Using the polyphosphazene synthetic platform, the polymer systems find wide applications. A team of scientists has developed a tool that can actually predict the success rates of certain cancer treatment methods and help patients by suggesting which treatment methods won’t work. The software actually uses individual genomic profiles and compares the genetic profile being analyzed to existing profiles and treatment outcomes. “With the recently available large collection of patient tumor samples, we developed a novel computational technique to identify genetic interactions in whole-genome scale and capitalize them to design optimal treatments for individual cancer patients,” said Joo Sang Lee from the University of Maryland Institute for Advanced Computer Studies (UMIACS). The new precision medicine approach could personalize cancer treatment and enhance drug development, putting it in collaboration with pharmaceutical companies, Lee said. Lee has worked with Eytan Ruppin, professor of computer science and director of the Center for Bioinformatics and Computational Biology to develop the technology, which Lee presented at Bioscience Day. Wenxia Song, a professor in the Department of Cell Biology and Molecular Genetics, has developed a way of inhibiting the bacteria that causes gonorrhea by identifying the very method the bacteria uses to attack and cause disease. ”Our solution (not based on an antibiotic) can prevent and treat drug-resistant gonorrhea, which is an asymptomatic and urgent threat according to CDC,” said Mark Wang, who completed his Ph.D. at UMD and worked with Song. Wang said that the method could prevent disease in both men and women. Marc Cohen, visiting assistant research scientist in the Institute for Systems Research (ISR), presented ErgonometriX, a personal wearable device and cloud-based system that can reduce lower back injury. The simple device can be worn by workers and has a sensor that captures physical movement and sends data to a cloud. The data is then analyzed using algorithms to suggest better methods to alter lifting, carrying and other physical demands to lower risk of back problems.